Task: Develop and maintain a positive image for a newly formed charitable and educational organisation. Strategy and tactics: Media relations as one of the main tools for achieving the strategic objective. Formation of and training programs for Open Russia’s press service and its offices in the regions. Issue monitoring and analysis; strategy revision. Creation of and continuous contact with the media pool through official and informal events for journalists, one-on-ones and exclusives. Creation and maintenance of an informative and user-friendly Open Russia web-site in Russian and English. Constant updates on the Foundation’s activities for media through distribution of news: notices, press releases, and reports. Result: Open Russia Foundation has become the most recognisable brand among Russian charitable and educational organisations. 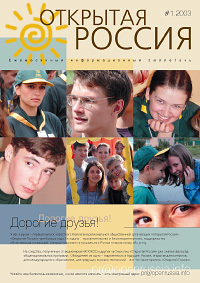 The effective work of our specialists ensured that the Open Russia Annual Report in 2003 won the first prize among reports of charitable and educational organisations.